- Eliminates several plugins from the reverb bus - The reverb can be exactly what you need in almost any situation. If you're looking for a reverb that does what 3 or 4 plugins used to do on your reverb bus, you've come to the right place. The ability to blend two different plates with one slider makes dialing in the tone you want a breeze. Adding compression and saturation adds a unique character that simply combining plugins cannot accomplish. Kush Audio takes a swing at Space, the final frontier, but can they change the landscape with their new reverb? Everything Recording kicks the tires on Goldplate to see if the company that regularly pushes the boundaries of processing audio can give reverb the same treatment. Goldplate is the next in a series of creative partnerships with other pro audio companies. While in the past, the bulk of Kush’s inspiration comes from hardware, Relab’s plate reverb algorithm beckoned for the UBK treatment. Utilizing Gregory Scott’s own unique take on mixing reverb, special tools not usually seen on a reverb plugin have appeared on Goldplate’s UI. At the heart of this plugin are algorithmic models of two particular plates – the EMT 140 and 240. The tonality of each of these hardware units lies in the material in which they were created. The EMT 140 was made of steel, which exudes a darker, dense quality in sound, while the 240 was built using gold foil, giving it a brighter edge. 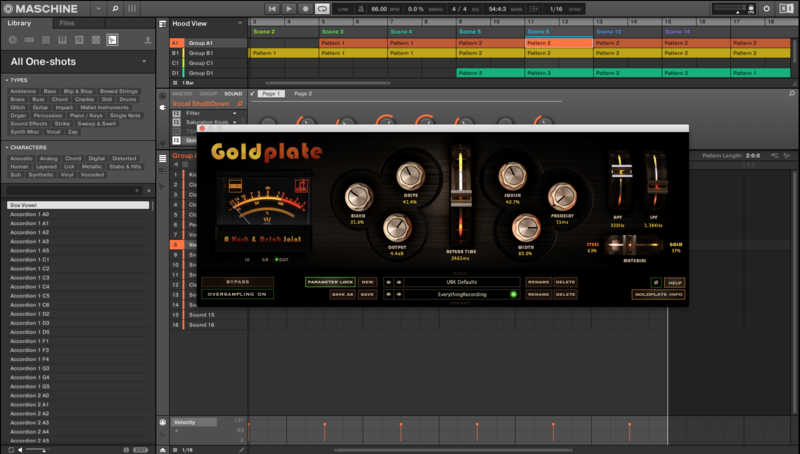 Of the many features that set Goldplate apart from other plate plugins, one stands slightly above the rest. Instead of giving the user the option to switch between either plate, Kush have created a slider to allow the two plates to be blended. Simply grab the “Material” slider, turn left for dark and right for bright; and if you’re feeling especially adventurous, go somewhere in between. The percentage of each material displays on the corresponding side of the slider. Goldplate does all the heavy lifting for you. Of course, this reverb has all of the usual controls like Blend, Output, Reverb Time (from 0.5 to 5 seconds), Pre-delay, and Filtering; but it’s the additional knobs that give it the Kush spin. On the input, side, saturation can be injected to dirty up the signal. On the output, audio can be compressed to groove with a variant of UBK One’s Squish preset. A Width control is also added to go from 0% (mono) to 100% panned hard left and right (stereo). No need to switch between multiple mono and stereo by re-adding the plugin. Not only is Goldplate packed with controls, the interface is inviting, with all controls laid out in a symmetrical, logical manner. Workflow is enhanced even more with versatile preset management, offering several different ways to browse presets. To add to the ease of browsing, control lock does just as the name says by allowing controls perfectly dialed to taste to stay that way when changing presets. What more could a plate reverb need? The onlycontrol I found myself reaching for was an input volume knob, but that is out of sheer laziness in not adjusting my sends properly. Shame on me honestly for that one but I had to find something to critique so I had to stretch. Seriously though, this plugin is superb. Kush did to reverb what the Novatron did to compression. 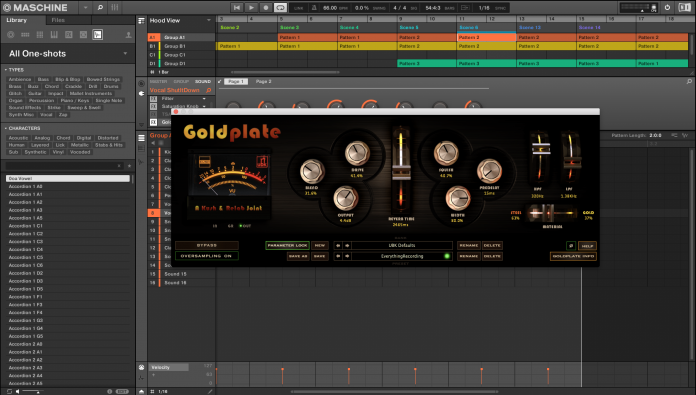 Goldplate didn’t just remove several plugins from my reverb bus – it does it better. Different saturation plugins, reverbs, and compressors will not always give the most pleasing result, but when the choices were painstakingly chosen and molded together, the result speaks for itself. Goldplate doesn’t just add size to tracks, it sculpts tracks into a cohesive unit, with each part better off for being graced with its presence. EQ doesn’t need to be used as heavy handed, weight shows up in the mix and a halo of top end hovers above the track. Goldplate is subtle when you need it to be and raucous when you want it. Most reverb plugins have a sweet spot in size – Softube TSAR has a great small subtle plate, Revibe has good long plate. Goldplate has no sweet spot. It has every spot. In conclusion, I admit Kush has a great track record with Everything Recording. Sure, I seems like I’m very biased by how I rant about their creations. I encourage anyone to prove me wrong on any point or statement I’ve made. Believe me, I used the reverb for months before finishing the review to try to find something wrong. I couldn’t find anything. I’m open to comments. I’ll even add any legitimate gripe into the review as an update. I doubt you’ll find one, but I encourage you to try.